The Godavari schedule of Ram Charan’s ongoing movie in Sukumar’s direction has been quite​ eventful for Charan and Mega fans. 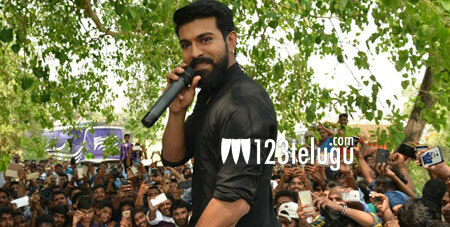 Hundreds of fans thronged to see Ram Charan and the Mega Powerstar went all out to meet them much to their delight. During his latest interaction with fans, Charan surprised everyone by urging fans to support his Babai Power Star Pawan Kalyan be it in films or politics. Charan went on to hail his uncle saying, “Pawan babai has been toiling hard shooting in this scorching heat only to entertain you all”. Charan also said that he has come down to shoot in the Godavari region despite the unbearable heat only to enthrall fans.